A rally-cry to support New Zealand's community of creators, from entrepreneurs spinning up a singular idea, to serial creators in startup or businesses big or small. show your support.sign up today. One who establishes something or formulates the basis for something. Founder.. carries connotations of creativity and innovation, determination, native intelligence, and a sense of fearlessness. Founders create something from nothing. Founders Central is an initiative designed to support founders to success, with insight driven programs, events and learning. A holistic approach, Founders Central will encompass both personal and professional development alongside a long-term vision for tracking outcomes. We understand that it might take 2 or 3 attempts before a business idea really works, so Founders Central is committing to a longitudinal approach to tracking, and celebrating success. From a successful investment and growth in a startup through to a founder taking their vision, history and approach into change focussed corporate or government environments. The lessons, data and insights from Founders Central will be fed back into the ecosystem as a whole, helping create stronger businesses, and better support for everyone. For us, founders are those who set out to establish something, from those spinning up a startup and people running traditional small businesses right through to those with an entrepreneurial mindset within larger organisations, and people with an idea contemplating making the leap to go it alone. Creating value is key to New Zealand’s economic success not only domestically, but in international markets. For this to happen we need to support the community of people creating this value, and Founders Central aims to do just that. Are you a founder looking to advance thinking, grow your business and gain support? We are taking expressions of interest from founders of all kinds, disciplines and business sectors. You may be an entrepreneur that has been there and is keen to give back to the founder community, a mentor with knowledge and expertise or an organisation or business looking to become a partner in Founders Central. Right now we are taking expressions of interest from both founders looking for support, and supporters. a hard path. 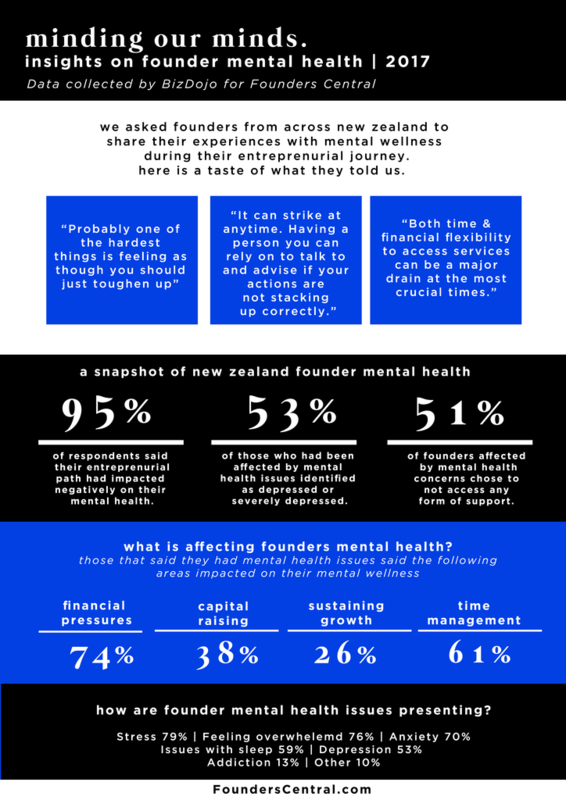 a perspective on founder wellness in new zealand. supporting New Zealand’s community of creators, from entrepreneurs spinning up a singular idea, to serial creators in startups or businesses big or small. Through BizDojo's work with founders across the country over the last eight years, Nick Shewring and Jonah Merchant realised that much of what founders need to succeed is still only being partly addressed by the ecosystem support around them. Their perspective is a unique one, partially because of the diverse founder community they have been immersed in since 2009 through their BizDojo network, but also because Jonah and Nick are themselves founders with many projects past and present under their belts. BizDojo is New Zealands national coworking and collaboration operator, and through this founder focussed perspective and national reach real change in the ecosystem is possible. Founders Central sets to take the insights they have gathered over the years alongside the knowledge of the partners, co-collaborators and of course founders that join Founders Central.